Let me tell you about a time that I was convinced my child had no brain. I also wondered if I was totally inept at teaching, talking, writing, and everything else because I was doing an apparently terrible job with teaching my child how to add. I’ll tell you about our year and a half of horrible, awful, no-good, just plain tragic math struggles with Curly when she was in 1st grade. I chose a math curriculum and was all excited. I never liked math in school and I really wanted a different experience for my kids. I wanted to make everything better than what I went through. I knew I would be able to empathize with them when it was tough but I was sure that they could triumph over math just as I had done. So, I opened the manual and we began. This was our Kindergarten year. Math went well for a full semester. We worked our way through lots of different concepts. Some were tricky at first but we mastered them. Others were easy and we breezed on through. Curly and I were enjoying math for the most part. This was not too bad! Then suddenly we moved into the next level book of the curriculum. This one required adding. Lots and lots of adding. We played games. We used blocks. I tried flash cards. I used the whiteboard. We watched videos. I had dad try to teach the lessons. NOTHING! My child did not get it at all. She could not add. You would ask her 3 + 1 and she would collapse on the floor in a fit of “I don’t know” and “That’s too hard!” You’re adding 1! Good grief! Just count up to the next number already! 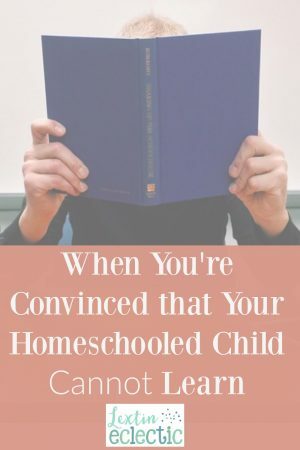 I finally became so frustrated that I was convinced that it was the curriculum. It simply wasn’t explaining it properly. I tossed it aside and after much research chose something else. We started at the very beginning with concepts of number sense, patterns, and things like that so we had a great time. We had so much fun – until we hit the lessons on addition. Then we died a very quick but excruciatingly painful death. I tried new games. I tried new tactics. We took breaks. We focused on other subjects. My husband taught some lessons. We pointed out math in real life situations. We drilled. We worked. We helped, and encouraged, and practiced. It took an average of 4 minutes for her to answer every single addition problem. And I mean problems like 6 + 1 and 4 + 2. The only ones she mastered were the 0’s! 5 + 0 = 5! Yes, we had those down easily. Everything else was a foreign language to her. I wondered if we would ever learn addition. How would we ever progress through math? We were almost to our last semester of 1st grade and my child could not add to save her life. I was feeling stressed. We took one last break and then started our last semester of 1st grade. Curly was slowly making some progress through the book but it still took her forever to do any addition problems. I tried to sit patiently as she would think and think and think before she would tell me the answer. But slowly she was able to do the work. It was not a noticeable breakthrough but just small steps in the right direction. We would work through 5 lessons and then get stuck. I would turn back 8 or 10 lessons in the book and we would start over and try again. Sometimes we would work to the same spot and get stuck so we would start over and begin again. Other times we would inch past that spot to get stuck at another spot. By July we had finished the math book. We were adding. Curly was still fairly slow while doing her computation but there was a glimmer of understanding when she worked. I thought maybe we had overcome our huge hurdle. I decided to give her the standardized 1st grade test that the public schools would have taken at the end of the year. I desperately needed to see how we were doing and have some record of progress we had made. I also wanted to see the weak areas as assessed by someone else. I was pretty sure that I knew where they were though. I gave Curly her test over a weekend. There were 3 math sections. I cringed the entire time she worked on them. She finished them all within the allotted time and when the test was complete I mailed it in. I waited anxiously for her results. One day the email came through with the test scores. I waited until my husband was home in case I needed his support as I cried over them. When I looked over her results my jaw hit the floor and I did cry. But they were happy tears. Curly had gotten a perfect score on each of the math sections. She did not miss one single problem. I was worried that the test results were maybe a fluke thing. When we started our second grade year I was terrified of our new math book. I should not have been. Curly has been breezing through subtraction, multiplication, and advanced addition. She has not had any tough spots in the math book and math has become something that is somewhat easy to her. She actually does entire addition problems in her head faster than I can complete them. She’ll be moving on to third grade math before the end of the school year. All the tears I cried over math (and her tears too), the hours we spent working, the times my husband took over, all the lessons we repeated, the breaks we took, the effort I put in to making sure her foundation was solid was so worth it. Math doesn’t intimidate her now. She has a great foundation and she is making huge progress in math. That’s not to say that we won’t have other times when we’ll be stuck on a concept or need to go back and review. But I’m so glad I did not give up or force her to rush ahead when she was not ready. For some reason it took an extraordinarily long time for her to learn one little math concept. But once she understood it, she was able to move forward at a pace that has left me far behind her. So, there will be times that you’re sure your child cannot learn. There will be times you will be stuck on a concept. Try not to stress or fret (although I know you will). Step back and reassess. Do you need a break? Does your child need a break? Do you need to focus on something else for a time? Do you need your spouse to step in and teach for a time? Do you need a tutor? Do you need new curriculum? Do you need to do more review? Do you need to keep practicing? Don’t push forward just because someone else’s timetable or another person’s lesson plans tell you to move on. No, take that time to get a solid foundation built. Your patience will be rewarded. In the end I’ve achieved a child who is now confident in her math abilities. We’ve struggled through math together and we can both fully appreciate the progress she’s made. Whenever she tells me that she can’t do something I simply remind her of our math struggles and point to her successes. We’ve come a long way in only a few short years. I’ve learned to be patient, to encourage, to be flexible, and to give us both a lot of grace. That’s giving her a good foundation not only for math but for our relationship.